My favourite graphics and illustration wizard, Matej Peklar, has just finished the cover for my second novel, Pendulum Pet (Cynicism Management Series, Book 2), which is to be released in March. The final draft is also done, and I’m about to start formatting the text for e-readers. In the meantime, head to this page to find out more about the upcoming novel and listen to the complete, quite extensive original soundtrack for it (stream it or download it free of charge)… Or grab Cynicism Management (links: Amazon | Apple | Inktera | Kobo | B & N), the first book in the series, for just 99 cents – it’ll be on sale until the end of February. Throughout February my first novel, Cynicism Management, will be on sale in most digital stores. During this time you’ll be able to get it for only 99 cents. For more information about the novel – or to grab a free direct download of the extensive original soundtrack for it – head here. Cheers! I grew to like the band immediately, so much so that I eagerly followed all their releases until their unfortunate breakup in 2011. I particularly appreciate their wonderful blend of odd time signatures and superb melodies, as well as what are often quite epic running times of their tracks: they’ve always had a knack for developing their ideas slowly and meticulously, not adhering to some arbitrary postulates about what is an “appropriate” length and what isn’t. Furthermore, as a drummer I became quite disillusioned with the over-abused straightforward 4/4 beats sometime in the previous millennium, as soon as I was old enough to know better: why write a song in 4/4 (or 1/1, as I often refer to the lousiest and most horrendously simplistic examples of that – kick hat kick hat kick hat kick hat), when you can annoy people with something fascinating like 33/16, I say! On the other hand I’ve always had a weakness for haunting melodies. Hence my obsession with bands that blend superb musicianship, intricate rhythms and great harmonies (plus vocal lines, if applicable). If the lyrics also happen to focus on anything else apart from the eternally imperative relationships between lovers, preferably on something a little bit disturbing, all the better. My favourite graphics and illustration wizard, Matej Peklar, has just come up with the first, rough sketch of the cover for my upcoming novel, Pendulum Pet. I love it – the “pendulum” dog, hanging from a leash, is as cranky as I have imagined him to be. I am currently polishing the final version of the manuscript, trying desperately to hunt down and eradicate any remaining typos, blunders, slips of the pen, clumsy formulations, inconsistencies and plain old brain farts; and then I have yet to format the manuscript for e-readers before publishing it in March, if everything goes according to plan. In the meantime, head to this page to find out more about the upcoming novel and listen to the complete, quite extensive original soundtrack for it (stream it or download it free of charge). The best news is that the guys are playing in Berlin in the end of February, and I fully intend to check them out. Finally: my new “author homepage” is up and running. It focuses on the literary side of my work, but also offers direct free downloads of most of my music, recorded in the recent years (I’ll probably be adding more from my “back catalogue” over time). The download packages – available to all “new release mailing list” subscribers – contain tracks in 320kbps mp3 format as well as artwork for each of the albums. Under the “Novels & Soundtracks” tab you can see more details about my books as well as download the complete soundtracks for both of them (collections of Cynicism Management and Ray Kosmick tracks, featured in the novels). Meanwhile, the second edition of my first novel, Cynicism Management, has also been released on Apple, Barnes & Noble, Inktera, Kobo, and Scribd (apart from Amazon). 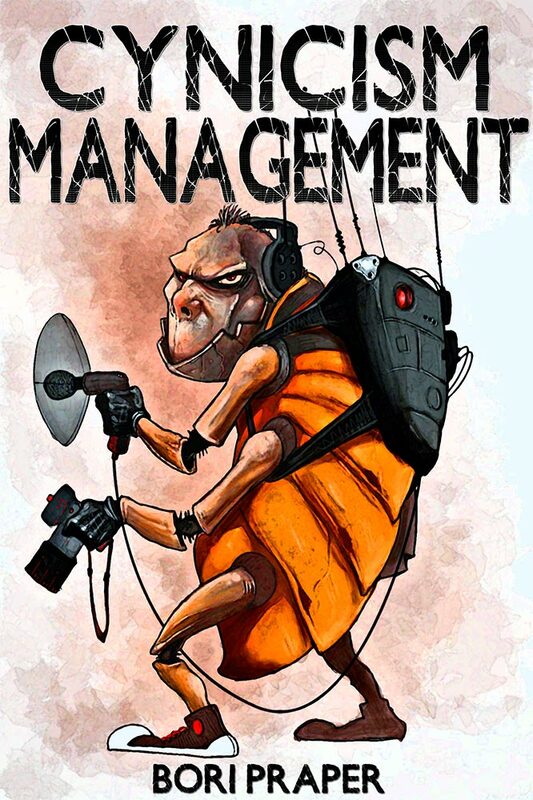 The second edition of my first novel, Cynicism Management, is now available on Amazon (the link should automatically take you to your local Amazon store) for $2.99 / £1.99. In other words, they won’t tell me why they charge the extra $3.10 in case of Slovenia, and they also can’t tell me why they won’t tell me that. I know of no taxes and reasonable “operating costs” (of sending a digital file to a Kindle and charging a credit card) that could result in an increase of price in excess of 100 %. However, the last sentence of the final response was probably volunteered by a rather disgruntled Amazon support staff member, and the actual interpretation from “bamboozlese” would probably be – I’m reasonably sure – that Amazon applies some ridiculous arbitrary surcharge in case of certain countries… And they obviously don’t want to advertise this fact. Be that as it may, the book will soon be published as epub in various other e-bookstores as well, hopefully without this astounding surcharge.